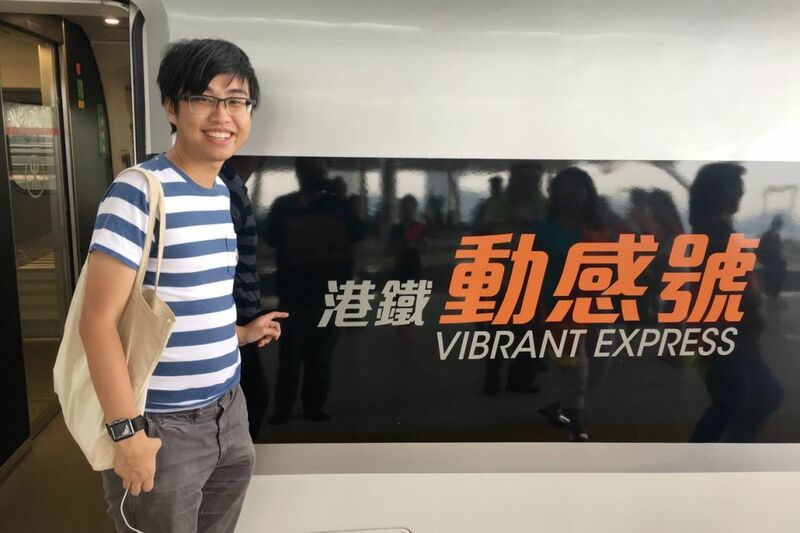 Wong, who lives in East Kowloon, woke up early to take the very first “Vibrant Express” train from Kowloon West to Shenzhen North at 7am on Sunday. But he found himself wavering for a moment as he completed the necessary immigration checks ahead of boarding. 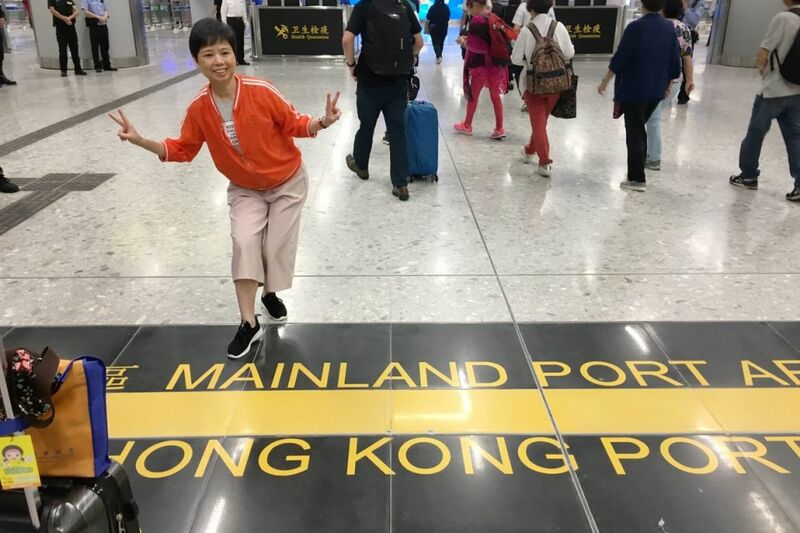 “I had a moment of hesitation, not wanting to walk through it,” Wong told HKFP after stepping across the yellow line separating the Hong Kong immigration area with the mainland port area. 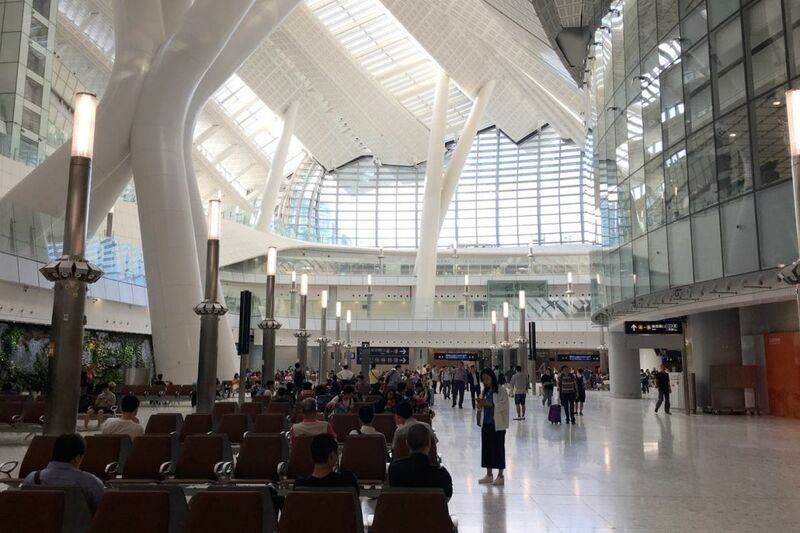 Controversy has surrounded the checkpoint arrangement, in which a quarter of the West Kowloon station in Hong Kong was effectively ceded to the mainland for faster immigration procedures. 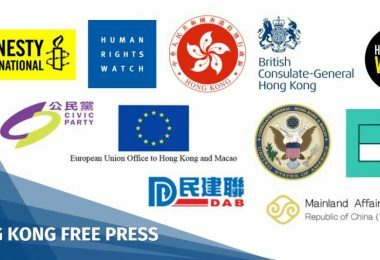 The mechanism was heavily criticised by Hong Kong’s pro-democracy camp and its top lawyers, who said it was unconstitutional. 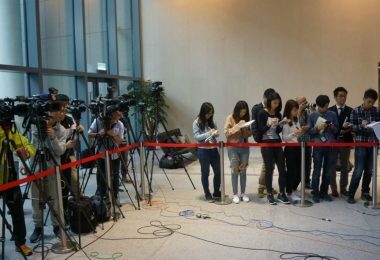 The matter will be challenged at Hong Kong courts next month. The train waiting area inside the mainland port area of the West Kowloon terminus. Photo: HKFP. 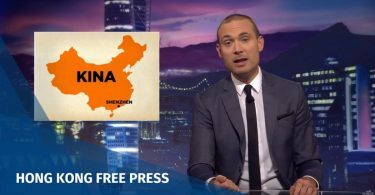 Wong’s ambivalence embodies the anger many Hongkongers feel towards the project, which they see as part of mainland attempts to erode the city’s autonomy and integrate it into the greater Guangdong region. The boundary line between the Hong Kong port area and the mainland port area of the West Kowloon terminus. Photo: HKFP. “The reason that the mainland refused to have checkpoints there was political,” Wong said. Mainland Chinese officers at the mainland port area of the West Kowloon terminus. Photo: HKFP. But Wong’s anger over the checkpoint row did not override his interest in trains. He took a two-part journey on Sunday – riding on the first train to Shenzhen North, which took 19 minutes. He then had breakfast at KFC and waited for an hour and a half to take another high-speed rail train to Guangzhou South, which took 41 minutes. 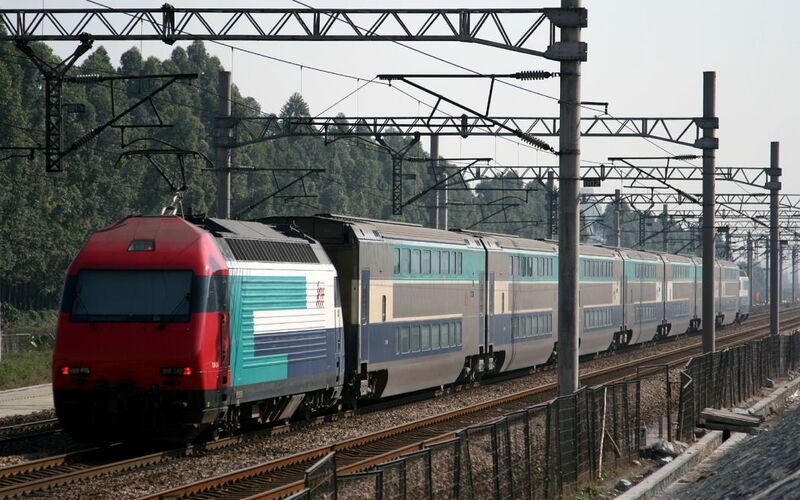 He explained that it was because the first train from West Kowloon to Guangzhou South – G80 – was a Chinese train, and he wished to take Hong Kong’s “Vibrant Express” train – the G6582 – to Guangzhou South instead. The G6582 was carrying individual travellers, tour groups, and reporters, but the cabin was far from full. 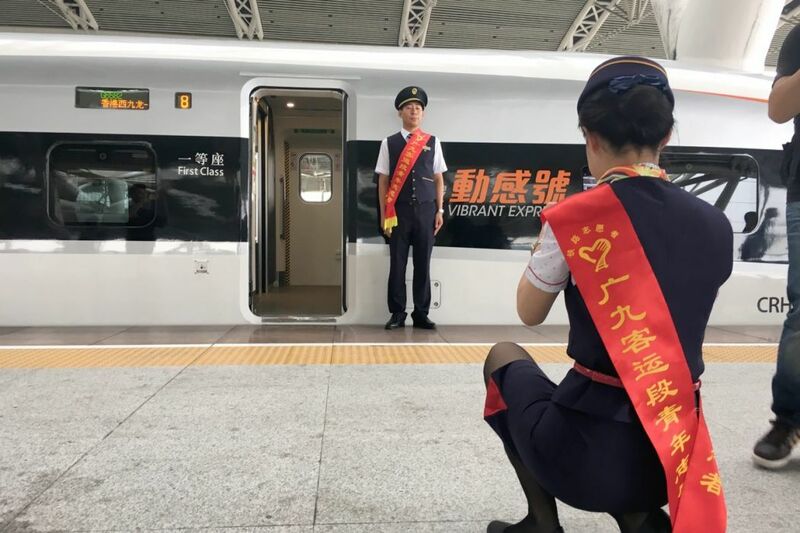 Wong said the train was “much more beautiful” than the Chinese one, and that it felt more familiar since the staff onboard were Hongkongers. First ever Vibrant Express train at Guangzhou South. Photo: HKFP. But the air conditioning was not working well inside the cabin and it felt stuffy, he said. He also criticised the fact that there were no USB charging ports on the train, saying that it was a strange omission. He said another problem was that the WiFi service onboard required a mainland phone number or a WeChat messaging service account. 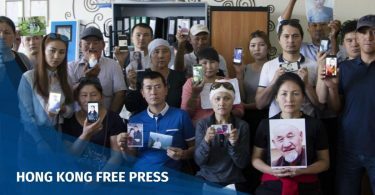 “It’s because it has to be linked to the mainland’s surveillance system – you may be arrested if you use Facebook,” he joked. 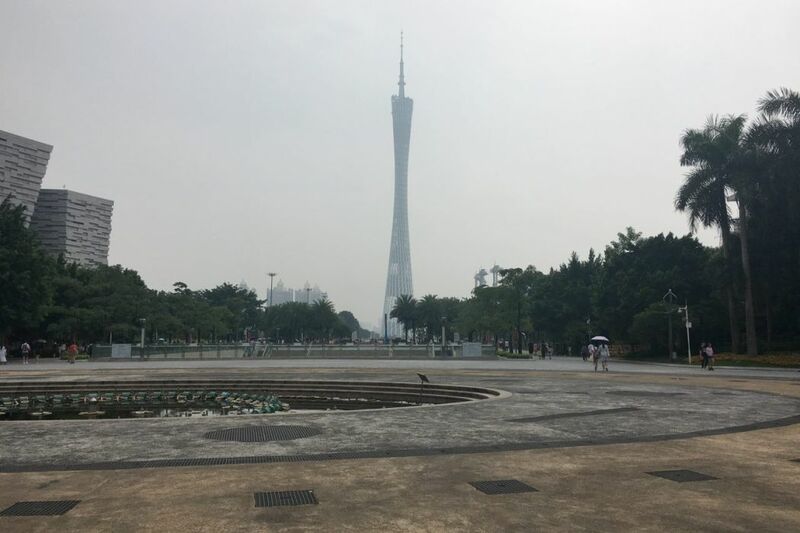 The Canton Tower in central Guangzhou. Photo: HKFP. 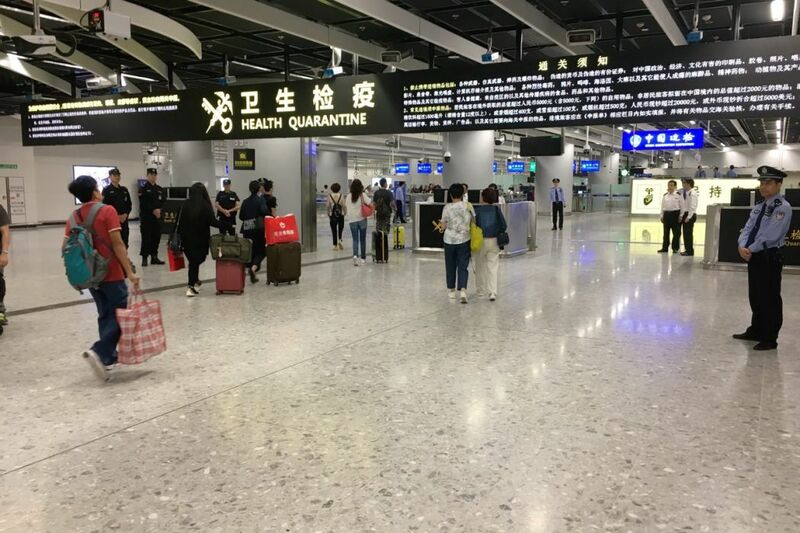 Wong initially wanted to stay in Guangzhou for a few hours, but because he had to work, he went back to Hong Kong right after arriving at Guangzhou South at 9:30am. 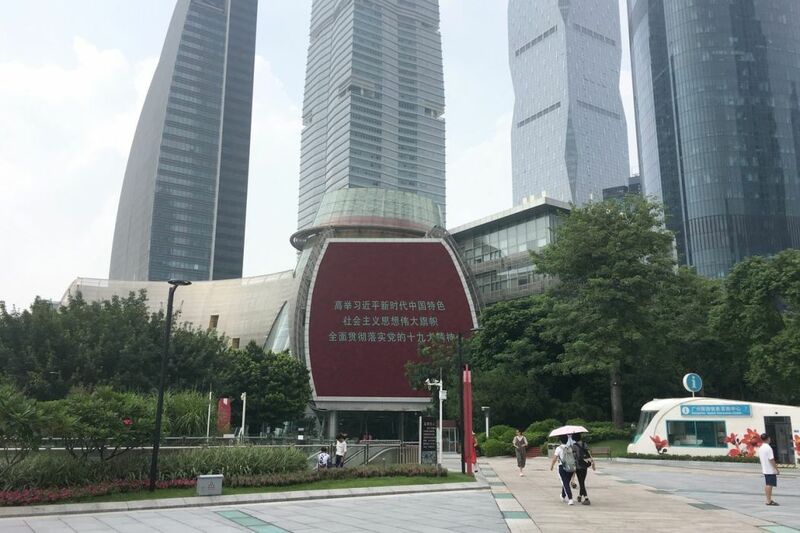 After arriving at Guangzhou South – a new area in the outskirts of the city – HKFP’s reporter took the Guangzhou Metro, arriving 43 minutes and two transfers later at Pearl River New Town station, in the central business area. The area is home to the Guangzhou East railway station, where passengers on the existing train service from Hong Kong would normally disembark. The journey to central Guangzhou took around two hours from Hong Kong’s West Kowloon Station. A political slogan supporting Chinese President Xi Jinping at central Guangzhou. Photo: HKFP. 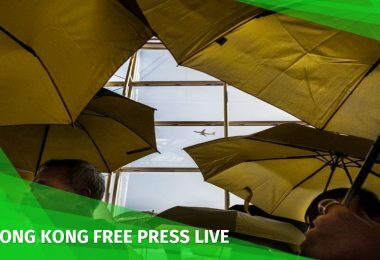 Before returning to Hong Kong, HKFP met a Guangzhou writer who often travels to Hong Kong for screenings at the Broadway Cinematheque in Yau Ma Tei and at The Grand in West Kowloon – which is right next to the West Kowloon terminus. 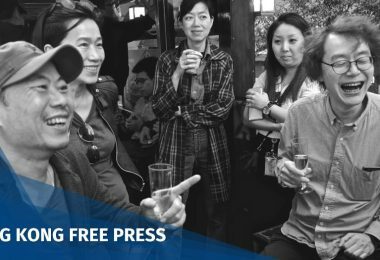 “Ken” wished to remain anonymous while discussing the project, but told HKFP that he would not use the new XRL service except on very special occasions. If he rides on the new train, it will take him at least 30 minutes to get to Guangzhou South by metro, as he lives near Sun Yat-sen University. Then it would take around an hour to travel to West Kowloon on the Express Rail. He said the metro ride was “too troublesome” as it was usually crowded and he would have to transfer twice, which would add significant travel time during busy periods. He said he would not take the railway for practical reasons, but also expressed disapproval of the joint checkpoint arrangement. A map showing the route and duration from Guangzhou South to Pearl River New Town metro station in central Guangzhou. Photo: Google Maps. Ken said it was more convenient for him to travel from Guangzhou East station, which would take him just around 15 minutes on the metro from home. He would then travel for an hour and 15 minutes to take the train to Shenzhen, where he would then transfer to Hong Kong’s MTR service. From there, it would take him an additional hour to arrive at the cinema. His journey would take around 2.5 hours, but it would cost HK$100 less than the XRL’s HK$247 fare. Ken has another option: travelling on the MTR’s direct train service from Guangzhou East to Hung Hom, which takes around two hours and costs HK$210. A first-class direct train ticket costs HK$250. A KTT direct train from Guangzhou East to Hung Hom in Hong Kong. Photo: Wikimedia Commons/慕尼黑啤酒/cc-by-sa 3.0. Ken said that even his parents, who live in the northern suburbs of the city, would not take the XRL. 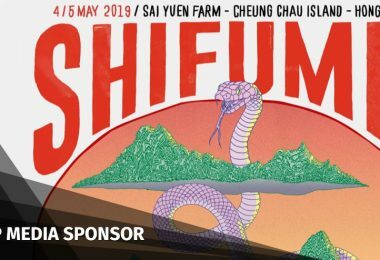 “It is like going from Tuen Mun to Cyberport for them to go to Guangzhou South,” he said, using Hong Kong districts as an analogy. The route would usually take around 90 minutes. After meeting Ken in central Guangzhou, HKFP’s reporter took his advice and booked a return journey on a direct train from Guangzhou East to Hung Hom – which took just over two hours.